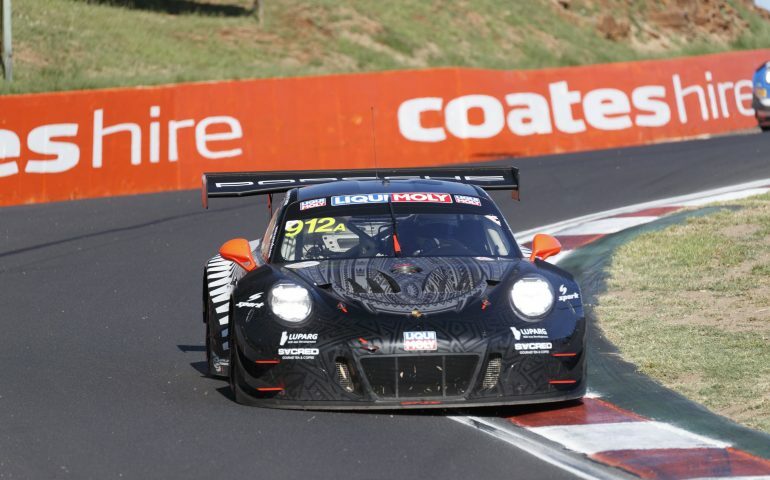 HEADING in to the final stints at the Bathurst 12 Hour, six different marques cover the first seven spots with all of those cars on the lead lap, setting up a cracking finish to the endurance race. As the clock has gone closer and closer to hitting zero, the order has been shaken out thanks to a long period of green flag racing, resulting in a pure strategy race to the finish. Shortly after entering the final four hours, Alex Imperatori inherited the lead thanks to Sven Muller pitting from the lead, handing the reins of #912 Earl Bamber Porsche to Mathieu Jaminet. The #75 SunEnergy1 Mercedes-AMG GT3 of Kenny Habul came into the garage to fix an issue, taking them out of the Pro-Am lead which the team had held for a majority of the day. Imperatori held a comfortable lead until pitting on lap 220, handing the Nissan GTR over to Edoardo Liberati while Marvin Kirchhoefer in the #62 Aston Martin took the lead of the race and Andy Soucek in Bentley #108 behind. From there on the top order cycled through for their pit stops; Augusto Farfus handed the #42 M6 over to Martin Tomczyk while Jaminet led from Matt Campbell in the sister Earl Bamber Porsche. While the two Porsche cars had better fuel economy, they both pitted much earlier than the third placed Marvin Kirchhoefer, driving the R-Motorsport #62 Aston Martin and on a strong strategy to the finish. A steering rack issue for the #911 Porsche pulled Jaminet into the pits 10 laps before schedule, dragging the car into the garage to fix the problem which put Campbell in the lead, something he held and extended throughout the stint. Campbell came in for his stop on lap 242, giving the Porsche to Dennis Olsen, taking on fuel and right side tyres only as Kirchhoefer took the race lead from Edoardo Liberati in the Nissan GTR. The battle for fourth on the road heated up with Martin Tomczyk and Maximilian Buhk fighting it out in a classic BMW v Mercedes-AMG battle, only making minor contact while trying to both pass a slower car. Around the lap 250 mark, most of the leaders hit the pits within a lap of each other; Buhk and Liberati first followed by Tomczyk and Whincup. All cars bar Liberati’s change drivers with Raffaele Marciello, Chaz Mostert and Shane van Gisbergen jumping in respectively. Kirchhoefe was the next to come in, giving over the car to yesterday’s unofficial pole sitter Jake Dennis to bring the Aston Martin home, emerging from the pits behind Olsen but ahead of the rest. Abril came in for his stop to relegate the lead to the #912 Porsche, handing the #108 Bentley to Maxime Soulet for the run home. Heading into the final two hours, the #912 leads with #62, #999, #108, #42, #18 and #888 all behind it on the lead lap and importantly, all running different fuel strategies.